The Rendezvous historic Lodge of Red Lodge, Montana is a (circa. 1934) log home built from the towering pines that were cleared to make way for the construction of Beartooth Pass. It became the project managers home during this historic undertaking in highway building. The Rendezvous offers a true sanctuary to one family or multiple families. Many use the home as a gathering point for reunions, celebrations, workshops and retreats. The kitchen is well appointed, roomy and the counter is enriched with 4 bar stools for all to gather. Here is a galley where it is rare to utter "Get out of the kitchen!" The dining area is conveniently close to the kitchen. With the lodge pole ceilings, wagon wheel chandelier, a nice art collection, comfortable furniture and a stunning hearth, the great room is, well, great. It is a place you'd expect to have a brandy with Teddy Roosevelt or Bill Cody. This home is situated in a park like setting, surrounded by low rock walls. The patio, complete with table and barbecue grill looks out towards the Beartooth Range. The hot tub (4 associates, 6 good friends), shares the large patio, and is only a few feet from the door. A stay at the Rendezvous, with its splendid ambiance is an experience that touches your soul. Here, the past is always present; it is Montana after all, the last best place. Talked to several different people over the course of our rental process. All we're extremely helpful and easy to talk to! Great rental. Kids asked why we hadn't stayed there before! We have always stayed out of town but loved being in town!! Great use of the entire house loved all the unique adaptations! Hot tub was a must after hiking each day. Loved the "wild" life that visited through the property! Everyone we interacted with was positive and helpful. Excellent experience. I would highly recommend AAA Red Lodge Rentals and the Rendezvous Lodge. They will not disappoint. We stayed there for a family reunion. It was a perfect place to bring us all together from our long journeys from various places across the US. Thank you! Team members communication was excellent! The owner of the house is wonderful! "Easter Rendezvous in Red Lodge We really enjoyed the Rendezvous Lodge over Easter weekend. The lodge was very accomodating for our family group of 11. We enjoyed the daily ""Turkey Parades"" as well as the deer wandering through. " "To the fantastic team at AAA Rentals Thank you so much for everything you all did for us on our amazing vacation. We absolutely loved RendeVous Lodge and you helped make it our home away from home. Nothing was ever a problem for you and the service was outstanding. We had the dream holiday and can see ourselves returning to Red Lodge one day. I am so happy that I found you. " "Rendevous Lodge was wonderful, cozy , and fun. Our family of 11, ages 2-91, stayed hear over Christmas. The young adults got to go skiing, those who wanted walked downtown, and the older ones sat by the fire. We had all the amenities we needed to cook Christmas dinner with a little improvisation. The hot tub was great after a day of skiing. The managers even came out on Christmas Day to thaw out the pipes and they were very prompt. " "Wonderful Holiday experience Along with our extended family varying in age from 2 to 92 our crew of 12 decided to spend the Christmas Holiday enjoying skiing and sight seeing in Red Lodge. Since our preference is for rustic but comfortable and clean accommodations, we chose the Rendezvous. I don't think we could have made a better choice. Although the Lodge is designed to sleep approximately 10 people the Lodge manager was very agreeable to let us bring a couple of fold out cots to accommodate everyone. We did have one minor problem on Christmas morning when the water line to one of bathrooms froze, but after we placed a call, the Rendezvous team was out within an hour or two on this special family day and had it fixed. That's customer service. The remodeling of the lodge inside has been very well done and the kitchen is well equipped for preparing meals, even a family Christmas meal. There was even a high chair which we really appreciated. Lots of firewood was supplied so it was nice to be able to keep a fire in the fireplace as long as we desired. The location was quiet and secluded which we liked. Although it was a bit far for some in our group to walk downtown as cold as it was it would likely be a nice stroll for most during warmer weather. All appliances inside and the hot tub outside worked very well. A very pleasant week of rest, relaxation, visiting and activities for our family. " 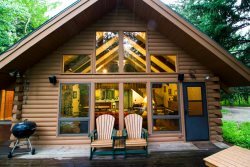 "Nice quiet place, cozy and comfortable Older log cabin with everything you need for winter ski trip. Close to downtown. Quiet location. We all enjoyed the hot tub. " "Great accommodations The Rendezvous Lodge and Red Lodge, MT were amazing! Couldn't ask for a better place to stay while visiting the area. The Beartooth Pass was a great drive with beautiful views. The trip to Yellowstone was a little longer than we originally expected, however, the accommodations at the Rendezvous Lodge very much bridged that. Would definitely stay here again if in the area. " "The Girls of '68 Reunion We loved the Rendezvous Lodge! It was perfect in every way and made our reunion so special. Loved having everything we could possibly need right there. Thank you for a great facility. I think we will definitely plan on gathering here again in the future. Thanks for everything! Sandy "
"Anniversary party Left on Aug 8, 2014 for a stay in Jun 2014 My family hasn't had a vacation since we all have left home.. It was my parents 40th anniversary so I pick this cabin in red lodge for them and the rest of my family we thought the cabin was very nice and had enough room for all of us I would pick this cabin again we had the best time ever and we will do it again :) "
"Relaxing Left on Aug 10, 2014 for a stay in Jul 2014 It's not fancy, but comfy and cozy with plenty of room, a large yard, deer, and close to town. Y-stone a little too far. " "As nice as described Left on Aug 8, 2014 for a stay in Jun 2014 Comfortable, tastefully decorated, well maintained and updated. If privacy is important to you, however, you will find issue with layout of bedrooms, which are linked, and require you to walk through one to get to another. " "Tremendous! Beautiful surroundings, neighbors, both human and animal. The house was well furnished and clean. It was within walking distance to all amenities. Welcoming flowers a very nice touch. Service provided by Red lodge Rentals was excellent. I wish the recycling had worked better. " "White Christmas Left on Jan 4, 2016 for a stay in Dec 2015 Our group of 9 stayed here over Dec 24-27 and give it great marks for a Christmas get-away. Loved the rustic furniture - fire place with lots of wood - cozy but ample supplied kitchen and dinner room style table for us to eat together and play games. Had to find the space heaters and extra blankets as the back rooms did get a little chilly with the bitter cold - but we were all very happy and Santa was able to find us there as well. The skiers enjoyed the proximity to the hill and the shoppers enjoyed the brisk walk downtown - and all liked the hottub at the end of the day "
"Log home from the past Left on Jul 31, 2015 for a stay in Jul 2015 Very lovely accommodations, rustic log and timber construction, bedding and other decor in keeping with that motif. Would love to have used the hot tub but time didn't allow, as we were ""just passing through"" and spent a good deal of time down in Main Street shops and galleries, up the ski hill road, and back up the canyon where the fire came down a few years ago. On the edge of town, a quiet setting--I've been to Red Lodge many times and have family there, and I never before knew this building existed. Excellent management of the property, very helpful information emailed immediately upon making the reservation. Various bed arrangements, with several areas to close off for privacy from other areas. I'd LIVE in this house if I could (but not quite so close to town). " "Fantastic! Left on Jun 21, 2014 for a stay in Jun 2014 Everything about it was great! Loved the cabin, loved the setting, handy to downtown, plenty of room for family. Great place for a family reunion. Kitchen set up was great, even if we did little cooking, too busy seeing the sights. Loved it and Red Lodge! " "Great family getaway! Left on Apr 10, 2014 for a stay in Mar 2014 We had a great time at the Rendezvous Lodge. It was quaint, rustic and fit more people than you would think. The kids loved the hot tub...kitchen completely stocked with essentials. And great in town location! Would definitely return. Thank you! " "Rendezvous Lodge - comfortable, perfect stay Left on Mar 27, 2014 for a stay in Mar 2014 Very charming cabin style home with plenty of room for family of 5 and more. Beautiful mixed wood cabin, with all the right touches. Very well kept, comfortable and well worth the price. Loved the place. " "Wouldn't have changed a thing Left on Jan 1, 2014 for a stay in Dec 2013 Our two families had everything we needed to make our stay during Christmas week amazing! The hot tub was great. The firewood was stocked and the gas stoves did a great job of keeping the cabin warm. " "Could not have had more fun! Left on Dec 6, 2013 for a stay in Nov 2013 This cabin was such a perfect spot for our little thanksgiving family gathering. The kitchen had everything we needed for preparing a wonderful thanksgiving meal. The bedrooms were beyond comfortable. The cabin was a perfect place for us to gather, relax, play games, enjoy some awesome food, knit, read, and talk. Thank you for creating this perfect space for us. "